SCVHistory.com AP0605 | Acton | Central Pacific No. 210 Offloading Ties for Track & Bridge Repair, 1870s. With Parker Mountain as a backdrop, Central Pacific Railroad's 4-6-0 Engine No. 210 and its tender are pulling rail cars from which ties are being offloaded near Acton in the 1870s. 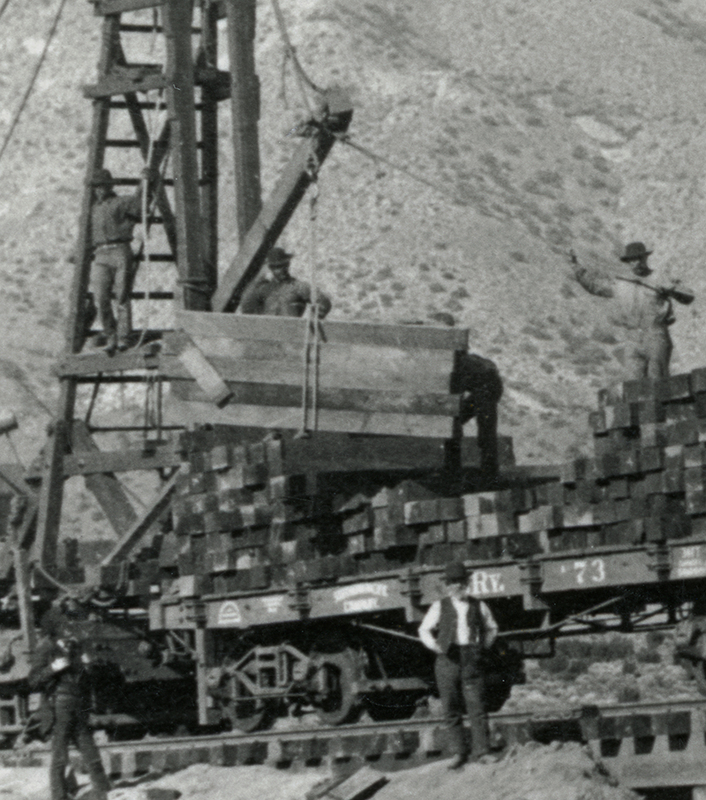 Acton historian Meryl Adams describes this photo: "Repair of railroad track and bridge; Parker Mountain, west of Acton, in background" (Meryl Adams 1988:40). A copy of this photograph resides in the A.B. Perkins collection. Perkins had it before 1963, when his friend Ted Lamkin made a photographic copy of Perkins' collection. Adams borrowed the photograph from onetime Newhall schoolteacher Emma Blum (Blum Ranch) for use in her 1988 book. From Adams' book (page 372), we can piece together that Perkins previously borrowed the photograph from Blum and returned it to her in 1968. Blum had likely obtained it from Richard E. Nickel, who was a prolific photographer — but probably didn't make this photograph because he didn't arrive in Acton until 1887. According to Robertson 1998, C.P. No. 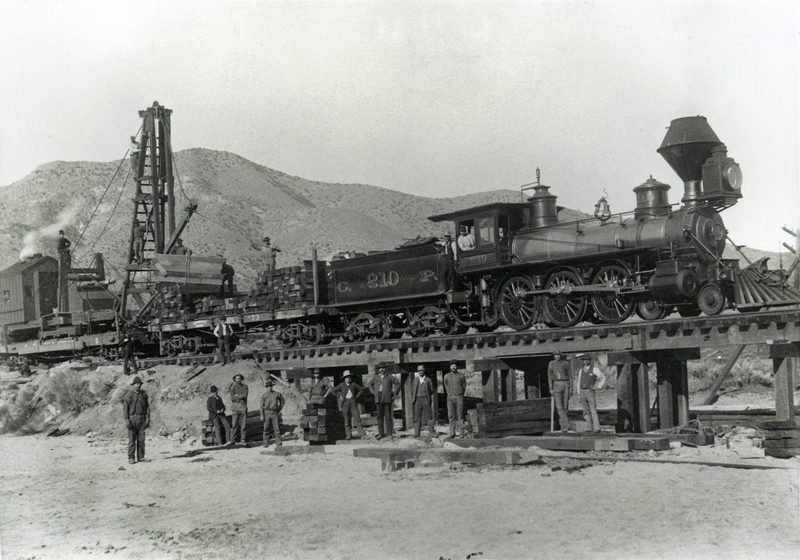 210 was built in April 1876, just a few months before the Central Pacific and Southern Pacific rails came together at Lang, southwest of Acton, to unite Los Angeles with the rest of the country. (But No. 210 was not at Lang for the ceremony. That was a similiar 10-wheeler built in 1867.) The manufacturer of No. 210 was Danforth Locomotive & Machine Company, aka Danforth, Cooke & Co., of Market Street, Paterson, Passaic County, New Jersey. 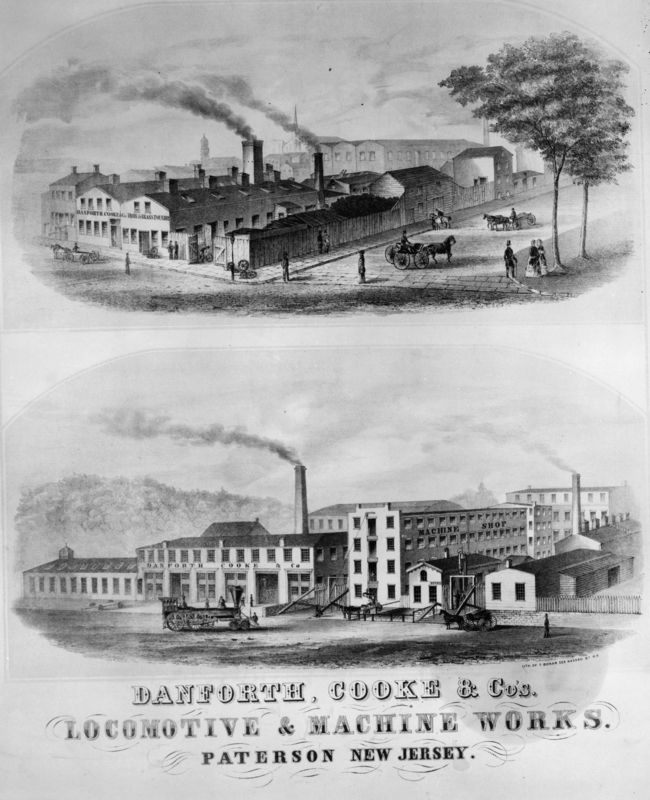 Danforth was one of eight locomotive manufacturers that merged in 1901 to form American Locomotive Company (ALCO). Why it's parked on top of a bridge that's in need of repair, we can't say. AP0605: 9600 dpi jpeg from copy print.